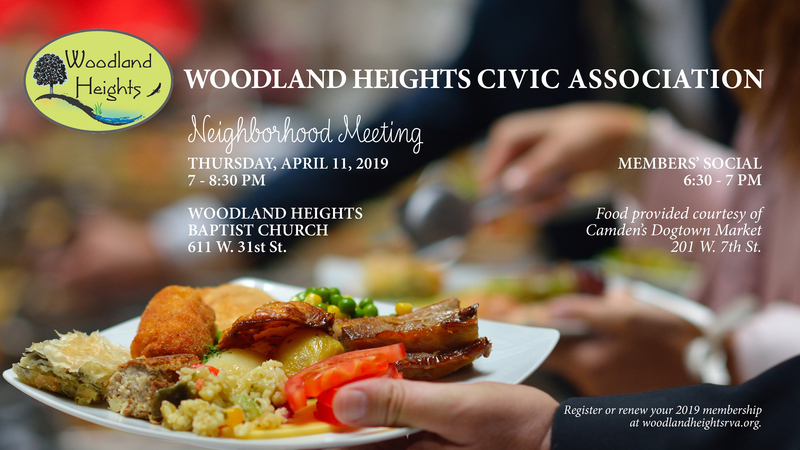 Join us for our Woodland Heights Civic Association meeting. Make sure you’ve registered or renewed your membership prior to the meeting so you can join us for a neighborhood social for current members before our meeting begins. Additionally, meeting attendees must be members to vote on business items during the meeting. 2018 memberships expired 12/31/2018. Beginning 01/2019, memberships have rolling start and end dates so you get the benefits of a full 12-month membership no matter when you join the Civic Association. We hope you’ll join us as a member, grab some food courtesy of Camden’s Dogtown Market, and take advantage of the opportunity to get to know your neighbors! Follow-up on Special Use Permit application for 2000 Riverside Dr.
Civic Association Plant and Seed Swap on May 11th at the McDonough Community Garden on McDonough St. and Forest Hill Ave.